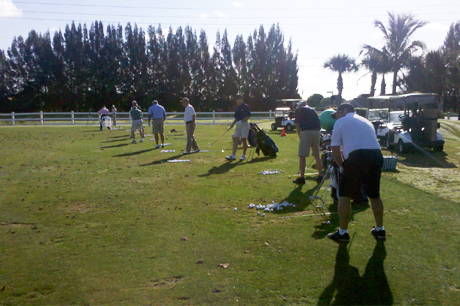 Our Florida golf schools and Florida golf lessons will be held in Vero Beach, FL at Pointe West Golf and Country Club. They have recently opened their new clubhouse and the golf course and practice facilities are excellent. The instruction is led by former “National PGA Teacher of the Year” David Glenz and complimented by Golf Magazine Top 100 Teacher, Mike Lopuszynski, former New Jersey Teacher of the Year, Bryan Jones and Wendy Ferrara, LPGA Professional. The highlight of the 3-day program is daily on course instruction with the pros. This format is guaranteed to get you off to a fast start in the spring and lower your scores throughout the season. Our most extensive Florida golf school program combines fun with golf instruction. All aspects are covered with special attention to “playing the game” at a high level. The highlight of this great weekend of learning is daily time on the golf course with the instructors. The day starts at 9am with morning instruction until 12:00noon followed by lunch and tee off with one of our instructors for 18 holes of on course instruction daily. "Get your junior golfer's game off to the best possible start in 2017 and have some fun in the Florida sun at the same time. This is a great mix of work on the lesson tee and lots of golf on course with the instructors. This class is designed to accommodate those who can come for 2 or 3 days based on your school schedule. Call or E-mail us for details.